India is a multi lingual, multi cultural country. The best part about India, is that it embraces all the different cultures that reside here and makes them its own. The same stands true for international influences as well. Valentines Day, Halloween and Friendship's day is celebrated with the same enthusiasm that we celebrate Diwali, Eid and Holi. If you want to experience the culture of any place, you should taste its food. Indian food is hot, spicy, flavorful with a lot of chillies, garam masala and oil. That is why if you eat any international cuisine in India you are bound to taste the Indianised version of it rather than the authentic one. And so, it is only in India that you will have Jain Pizza and Pasta i.e. Pizza and Pasta made without using onion and garlic. Authentic Chinese food is majorly steamed, blant, and light on flavor. But if you check out the Chinese food menu in India, it is hot, spicy, oily and very very flavorful. And that is why Indian cuisine remains my favourite kind of cuisine, no matter which part of the world I go to. 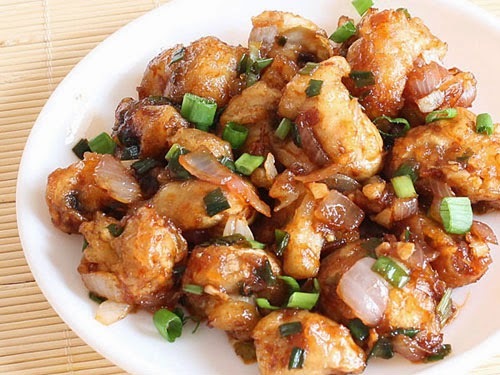 Today I am here to share an Indianised Chinese recipe that I stir up, which will give any Chinese restaurants in Mumbai, a run for their money. You know, I am kidding..but you get the point right. Wash the mushrooms thoroughly and dry them on a kitchen towel. Dice the mushrooms, and marinate them in salt and ginger garlic paste for about 15-20 minutes. Dice the capsicum and spring onions. Separate the greens from the spring onion and set aside. Now, in a wok heat some oil. Prepare a batter of cornflour, maida and soya sauce. Dip the mushrooms in the batter and deep fry till mushrooms turn golden brown. Strain and set the mushrooms aside on an absorbent towel. In another pan, heat some oil. Add finely chopped green chillies, ginger and garlic and saute for about a minute. Now add the chopped onions and diced capsicums and stir. Let it simmer for about 5 minutes. Now add the mushrooms, chilli sauce, soya sauce, a few drops of vinegar and stir. In another bowl, make a batter of cornflour, soya sauce and water and mix well. Now pour this mixture on the cooked veggies , just enough to coat them. Stir well. Once the batter coats the veggies well and cooks, garnish it with chopped greens of the spring onions. Mushroom Manchurian is ready to be relished. P.S. Picture used for representation purpose only. I do not own the image. indians need a tadka in everything. I have been to china twice, n the food is really vomitish especially with all that smell of non veg. I only had boiled beans n potatoes . The good part -lost 5kgs n came home.. I don't really like mushrooms, like the longer ones though ,but recipe sounds surely good. :) enjoy.